I'm a bread lover. Give me bread, any kind, and I'll eat it. What's my problem? I never get bread names right! Take this kind of bread, for example. As soon as I made it and tried it, I knew I had eaten it before, but I had never known it's name. Now, the name will be ingrained in my head forever! Williams-Sonoma: Bread gives a really good side note for this recipe. 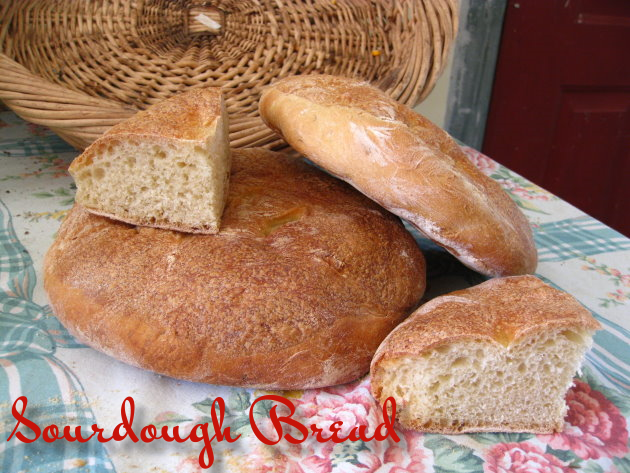 "ABOUT SOURDOUGH: Using a sourdough starter is an ancient method of beginning to make a leavened bread. The starter consists of small amounts of some of the basic bread ingredients such as flour, water, milk, and, in this recipe, yogurt. This mixture is left out to attract wild yeasts from the air. The yeasts feed on the starch in the flour, resulting in the fermentation and souring of the mixture and creating a base to which additional ingredients can be added to make a dough. The starter may be left to develop for many days, depending on the desired degree of sourness." 1) In a heavy-duty mixer fitted with the whisk attachment, combine the water, yeast, sourdough starter, and honey. Beat on low speed until just smooth, about 1 minute. Cover with plastic wrap and let stand at room temperature until doubled in bulk, about 1 hour. 2) Switch to the paddle attachment and stir in the starter mixture on low speed. Add 3 cups of the flour, the butter, eggs, and salt. Beat on medium-low speed until smooth, about 1 minute. Add 2 more cups of the flour and beat for 2 minutes. Switch to the dough hook. Beating on low speed, add the remaining bread flour, 1/2 cup at a time, until a very soft dough forms that pulls away from the bowl sides. Knead on low speed, adding flour 1 tablespoon at a time if the dough sticks, until smooth, springy, and moist, about 6 minutes. Scrape down the sides of the bowl. Brush the bowl with a thin film of melted butter and turn the dough to coat it. Cover loosely with plastic wrap and let rise at room temperature until slightly more than doubled in bulk, 1 1/2-2 hours. 3) Line a baking sheet with parchment (baking) paper and sprinkle with the cornmeal mixture. Turn the dough out onto a lightly floured board. Divide the dough into 3 equal portions and shape each into a tight, round loaf. Place the loaves, seam side down and at least 4 inches apart, on the prepared sheet. Sprinkle the tops with flour and rub in. Cover loosely with a double layer of plastic and let rise in the refrigerator for 8-12 hours. 4) Place a baking stone on the bottom oven rack and preheat to 450F. Using a thin, sharp knife, make 3 gentle slashes across the top of each loaf. Place the pan on the stone and bake for about 10 minutes, then reduce the heat to 400F and bake until the loaves are golden brown, 20-25 minutes longer. Let cool completely on racks before slicing and serving. 1) In a bowl, whisk together the water and yogurt. Add the flour and dry milk powder; beat until well blended and smooth. Transfer the mixture to a 1-qt glass jar, ceramic crock, or plastic container. Cover loosely with plastic wrap or a double thickness of cheesecloth (muslin) and let stand at room temperature for 48 hours, stirring the mixture with a whisk twice each day. It will be bubbly, with a fresh sour smell and the consistency of pancake batter. A clear or pale yellow liquid will form on the top; just stir it back in. If the liquid is any other color (such as pink or green), discard the starter and make a new batch. Cover loosely with plastic wrap and store in the refrigerator. 2) To use the starter, measure out the amount called for in a recipe and let stand at room temperature until it starts to bubble, about 1 hour. To feed the remaining starter, add 1 cup flour and 1 cup water, stir to incorporate, and let stand at room temperature for 24-48 hours to begin fermenting again. Store in the refrigerator, covered loosely. The flavor of sourdough starter improves with age and keeps indefinitely. If you want to print these recipes out, go here to the Sourdough link and here to the Starter link on the Williams-Sonoma site.